To enjoy a week end in a calm and quiet place with a sprinkle of history amidst abundant natural beauty, Garh Panchkot (or Gar panchkot) should be the option. Located in the foot hill of Panchkot (i.e., Panchet), Garpanchkot is the boundary of Bengal (Burdwan District) and Jharkhand, can be reached by car from Asansole (86 km), Durgapur (133 km), Kolkata (295 km). The nearest city is Asansol. This picturesque place, surrounded by small forest and hills, carries the rich history of ancient Bengali architecture ruined by Maratha ‘Bargi’. Panchkot was a part of an ancient East Indian kingdom known as Rajchakla Panchkot, locally known as Panchet. Panchkot Giri has its references in the Puranas also. The place was then known as Sekhar bhum from which the founder king of Singh Deo Dynasty Damodar Sekhar derived his name. Damodar Sekhar, established Panchkot Raj probably during early 90 AD with the help of Sardars of Jhalda and expanded his kingdom over several other parganas. To give recognition to the main five (panch) clans (khunt) of the locals the kingdom assumed the name Panchkot. The kingdom was probably a part of old ‘Tilakampa’ Kingdom. The ruins of Telkupi, the said capital of Tilakampa (submerged) went under water after the construction of Panchet Dam. A Maratha cavalry was sent by Bhosle who entered Bengal through Panchet and started looting the countryside. These Maratha men came to be known as “Bargi’s”. For about 10 years they looted and plundered Bengal. It ended in the year 1751 after a settlement was reached between the Nawab of Bengal and Maratha King. During one of these encounters Garh Panckot was attacked by the “Bargi” and having defeated the King’s guards they destroyed it after looting and plundering the palace. It is believed that all the 17 wives of the king committed suicide in a nearby well during the attack. Since then this place lies in ruins. The tourists need to arrange a car to go to ruins. It is about 10 km from the resort. The ruins are a great mixture of various types of art and architecture. 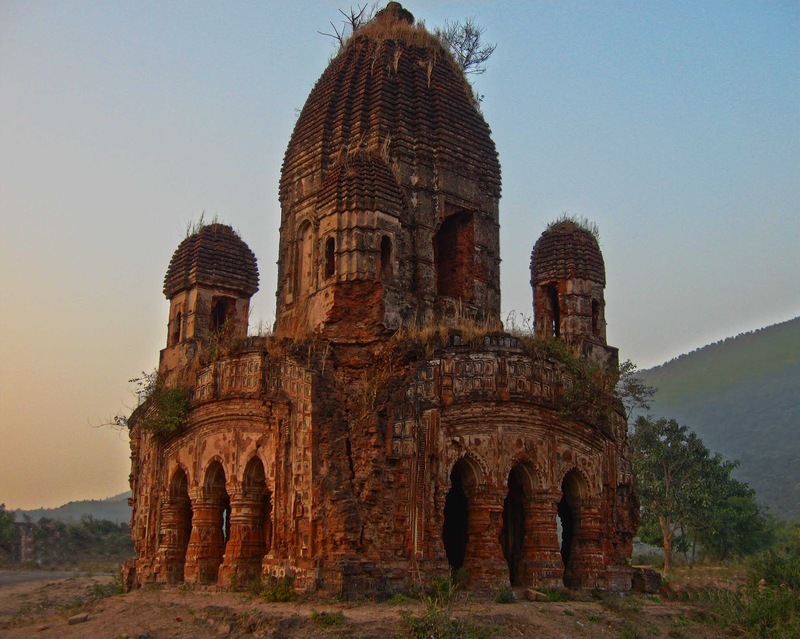 The ruins of the Garh (fort) of Singh Deo Dynasty are located at the southern foot hill where a group of temples are still standing in a dilapidated condition. The temples are of different architectural styles – mostly two distinguishable styles – Stone Rock Style and Vishnupuri Style. It is believed that the Bishnupuri styled temples housed Krishna and the followers were mostly vegetarians whereas the Stone Temples housed the figure of Kali and the followers were non-vegetarians and also believed in animal sacrifice. The principal one is “Pancharatna Temple” accompanied by “Jor Bangla” temple of Vishnupur. Pancharatna Temple still echos some depleted but exquisite peice of presumably pre-muslim period terracotta work on its arches and pillars. Another one temple is “Pirha Temple” made of stone. Almost 500 mtr. uphill from the main ruins of GarhPanchkot lies “Dhara” – a potential spring channelled through “Cow mouth” made of stone. There is also a very old stone temple dedicated to lord “Rama”. Surprisingly a “Jain Cave” has been found that in the vicinity, hence it can be said that the hindu king was tolerant to other religion. Located at the very strategical position, the guard Quarter stands as a formidable place. It is spread over a 500 sq-mt. area and near about 600 ft from the sea level. Located at the middle of Panchkot hill, the quarter is surrounded by solid rock with one entry point, the pyramid like hollow gate from where the entire palace below and the surroundings could be watched. The “Singha-dwar” (main gate) was the only entrance to the area. Today, the moat has been reduced to a small pond with a road running through the middle of it. A broken entrance gate still remains as an example of the once famous “Singh Dwar”. It is 7 km. Away from the main ruins. Not much information is available but given the arches and the pillars scattered across an area of about 20,000 sq feet(the Palace alone) would have been a massive structure. As legend has it, that the king had 17 wives and they all stayed in this palace lending credence to its size. The material used to build the Rani Mahal is a bit different from that of the temples and the Guard’s quarter. It uses “Choon Surki” or a paste made of lime and powered clay bricks fused using water as a base to hold the fire clay bricks. This style of masonry was quite prevalent in that particular period and it still exists. The arches on the other hand mimic the Mughal architecture which indicates that the Rani Mahal was build later, possibly during the 16th century AD compared to the stone temples which are nearby. From the WBFDC resort, tourist can trek to the view point of the hill top. It is a bit adventurous. A lovely panoramic view can be observed. The tourist can also enjoy the nearby seeing places as well. By hiring the car Panchet Dam or Joy chandi hill can be reached. Panchet Dam is 2km away from the resort. The sunset is very colourful there and boating is a famous sport in that place. The tour will be incomplete without the tribal dance. Tribal dance is conducted by the resort and must be booked before 24 hours. The tribes belong to santal, kol, munda. They perform their traditional dance with the beats of tribal songs accompanied by traditional instrument like “Madol”, and “payel” (on their feet). Under the dark and star full sky their performance leads to old historical Bengal. After spending an awesome tour, the tourist can come back to their life in the same route. By car from Asansole, Durgapur, Barakar, Kumardubi, Kolkata. Nearest train station is Kumardubi. WBFDC Forest Resort is the only option to stay there. The room must be booked from Kolkata or Salt Lake WBFDC office. Carry photo ID proof.